Betrayed, a Novel by Wodke Hawkinson, Brook, a Denver socialite, seems to have a good life until she becomes the victim of a botched carjacking. In a matter of minutes, her life is forever altered. She is abducted, transported, and held for days by three brutal men in a remote mountain location. She escapes only to end up barefoot, nearly naked, and hopelessly lost in the Colorado wilderness at the beginning of a harsh winter. Lance, a man who has shunned society, lives like a recluse in a rustic cabin far removed from the modern world. He likes his solitary life. But his world is about to be turned upside down. Advisory: Contains sexual violence and strong language. In our novel Betrayed, Brooklyn is abducted during a botched carjacking. She endures horrific abuse at the hands of her captors and her situation is desperate. In spite of the hopelessness of her predicament, she determines to somehow survive. She refuses to give up. Parts of the novel were difficult for us to write, and are hard for some people to read. However, we didn’t want to gloss over a crime that is so horrendous it alters the victim’s life. We wanted to make the story as realistic as possible. Once Brook is free of her captors, the novel takes a turn and the scenes were much more enjoyable for us to write. The following excerpt details one of Brook’s escape attempts. Gina slammed Brook with her forearms, knocking her onto the mattress. Shivering, Brook grabbed the stained sheet and wrapped it around her nakedness, keeping her gaze glued to Gina all the while. Gina’s eyes roved the room and fell on the torn garments scattered about the floor. Swooping down, she grabbed them and stormed out, bellowing, “Are you guys out of your mind? Do you know how expensive these clothes are? 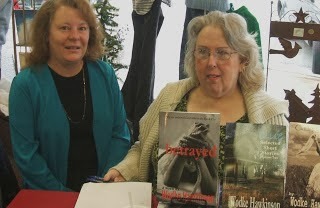 I would have loved….” Her voice trailed off as she moved away from the room. Minutes later Brook heard the small ding of a microwave. The smell of food reached her, but did not stimulate her appetite. She listened to her captors through the thin walls as they talked around mouthfuls of what smelled to her like popcorn and pizza. No one offered her anything to drink or eat, which was fine with her. She didn’t think she would be able to keep anything down, even if someone shoved food in her mouth. But, the point was well taken that she would not be fed. Her life was to be forfeited. Once the initial rush of adrenaline drained away, Brook became aware of pain flaring in her feet. Her barefoot rush into the wilderness had left cuts and bruises on her soles. She rubbed them gently against the mattress. They were just more injuries to add to the list. Darkness descended. Lightning flashed outside the window and thunder boomed, startling her. The lights in the room blinked off and then came back on. Brook pulled the blankets closer. Wiggling down between the mattress and the wall, she tried to become as small as possible. Following another loud crack of thunder, the lights went off and stayed off. Crazy patterns crawled around the room; dazzling brightness alternated with menacing shadows. Rain cascaded between the bus and the window. The storm sounded as if it were in the room with her, surrounding her, cursing her. She wept. Her mind raced frantically away from thinking about what she had just endured. She pushed away even thoughts of Clark because the yearning for him hurt so much she could not bear it. Riding waves of pain, she let the tears flow until there were no more to tears to cry. After a while the house grew quiet. Brook crept painfully to the door and pulled it open a crack, listening. Hearing nothing but the rain outside, she eased into the hallway and tiptoed towards the living room. Lightning illuminated the room for a long moment, and she could see Pete and Gina sleeping on the fold-out couch. Their bed filled the small room; she would have to go across it to reach the door. Carefully, moving mere inches at a time, Brook stepped onto the mattress, swaying slightly to retain her balance. She had only taken two small steps when fingers wrapped around her ankle. “Where the hell do you think you’re going?” Pete’s voice came from the dark. Brook yelped, jerked her leg free, and fell across the bed and onto the floor. Jumping to her feet she yanked the front door open and darted outside, only to be grabbed around the waist by Pete. “Noooo!” she screamed into the pouring rain. Wodke Hawkinson is the name under which K. Wodke and P.J. Hawkinson produce their co-authored works. They have co-written four novels, an alternate ending to Betrayed, three short story collections, and several short story singles. Betrayed can be purchased here.